Oracle has released its much-anticipated Java SE Subscriptions price list, available here. You may be a ‘non-Oracle house’ but this new type of support could change that! Are you aware of the impact this may have on your organisation and what you need to do to remain compliant and supported? Java SE Subscriptions will impact all commercial Java users, not just ‘legacy’ Oracle customers. As of January 2019, Oracle will charge customers for a subscription fee which includes license and support. This represents a change from the previous agreement whereby customers pay only for ‘Commercial Features’ for Java. Java is a platform-agnostic language comprising of a ‘runtime’ environment (called the JRE) to allow users to run the Java programs, as well as the Java Development Kit (JDK – allowing developers to write programs in Java). Java is typically used in enterprises on both desktop PCs and on application servers. Additionally, Java may be embedded into devices such as consumer products or devices used for specific tasks such as avionics or telecommunications. Oracle’s Java SE subscriptions affect desktop and server deployments. It is worth noting that these features are part of all Java SE downloads currently and are not separately ‘downloadable’ features; they merely require a flag to be set to access these components. These features continue to be ‘commercial’ features in the Java SE subscription. Oracle’s new Java subscription price-list replaces the above previously available licenses and now provides a combined license and support subscription. This enables commercial customers to gain access to continued support of Java beyond January 2019 as well as critical security patches. This new model for Oracle Java SE will be by subscription only for commercial use; this article discusses this in more detail. How does this subscription differ to traditional licensing? Oracle is keen to stress that the new subscription is akin to Linux subscriptions and allows for a zero-up-front overhead cost, instead being based on a monthly all-inclusive fee, as well as providing flexibility as to timeframes for which a subscription is required. ‘Classic’ Oracle licensing and support rules are not as relevant to these subscriptions: you should have more flexibility on termination, for example. It is likely that Oracle need to recuperate some money for the on-going development of Java as well as providing on-going support. In Oracle’s eyes, this also represents an opportunity for companies to gain control of their Java deployments and to take advantage of Oracle’s Java management capabilities (such as the Advanced Management Console) as well as enabling access to security fixes as they become available. You can also benefit from continued support (including security patches) for older versions enabling you take your time in migrating to later releases. Support and security are not the only reasons or ‘benefits’ for the subscriptions: you should take advantage of the enterprise management and other aspects of the Java SE subscription. Without a subscription and based on the assumption that you are using Oracle Java for commercial purposes, you will be required to migrate Java SE applications to an alternative Java supplier such as OpenJDK: it is recommended you do this before public updates are ceased or before your subscription lapses. If you already have licenses either as standalone Java SE licenses or as part of another Oracle middleware product (see below; there are restrictions), you may not be required to buy Java SE subscriptions for these environments. However, an assessment of the ‘old model’ versus the new subscription will be worthwhile to understand your options. Use existing perpetual licenses for Java SE which you bought prior to July 2018, e.g. Java SE Advanced Desktop, Java SE Suite. Using existing Oracle middleware products which include Java SE and which cover the environments for which you require updates and support. The following middleware products include Java SE –however it is limited to applications running WebLogic (it does not cover third-party applications). In the absence of the above, or in the case of your Java SE Subscription lapsing, your rights to any commercial software downloaded and access to support will cease – therefore, you should migrate (to OpenJDK or similar) before the end of your subscription. At this stage, it is not clear whether ‘standard’ Unlimited License Agreements or enterprise-wide agreements will be readily available. We Want Support: How Do We Measure And Price This Up? Note: Named User Plus (“NUP”) is defined in the same way as standard Oracle technology products currently; however there are no Named User Plus minimums. The essence remains the same, each person (or less so, device) using the software will need a license – in a lot of organisations it is likely that a count of ‘desktop’ PCs including laptops will be used to base the NUP count. As ever, it is important that you read and understand the metric definition. Note: ‘Processor’ here is the metric you may already know from other Oracle technology products; however, it is not expected that Oracle’s ‘policies’ regarding partitioning, failover and disaster recovery will apply in the same way to counting Processors for Java SE subscriptions. Therefore, counting license requirements should be easier than ‘classic’ technology products. You can see by the ‘tiering’ of quantities above that Oracle expects some customers to buy large quantities of these products. In a subtle difference to Oracle technology product licensing, it is important to note that you may end up licensing servers and desktops which interact; i.e. servers are not licensed by Processor OR Named User Plus – it is more the case that any installation which requires support / security patching will require a subscription; the Processor and Named User Plus metrics are not mutually exclusive for a given application or server. We can help! Even if you can count your deployment, like every Oracle licensing situation, you should seek experienced independent license specialists — Version 1, comprising of a large team of Oracle licensing experts as well as a large team of Java experts is well placed to advise you technically and commercially and has already advised clients on their support options as well as assisting them in migrating to alternative solutions. How Are Oracle going to Audit Usage? The details remain to be seen at this stage, however there will no doubt be monitoring of access to My Oracle Support for Java SE support and patch downloads—you will need an appropriate support agreement in place which covers your estate. Discovery will be approached in a different way to ‘classic’ Oracle products but will be likely to exploit centralised desktop and server management; potentially providing audit results a lot quicker than other ‘legacy’ products. Given the availability of employee population figures in annual reports which may give a very rough idea of the size of a desktop population, unlike some other metrics, it will be quite easy for Oracle to estimate the size of your estate and determine an order of magnitude for your subscriptions. You should expect Oracle to have their Java experts involved in any audit. Should you not have subscriptions of the expected magnitude in place, expect a review! This change is less about licensing and more about support. Several options are available to customers, including migration to OpenJDK – however such a migration is not trivial. Version 1 has a rare combination of independent license experts AND industry-leading Java experts who can help assess technical and license implications of the new Java SE changes for your organisation. 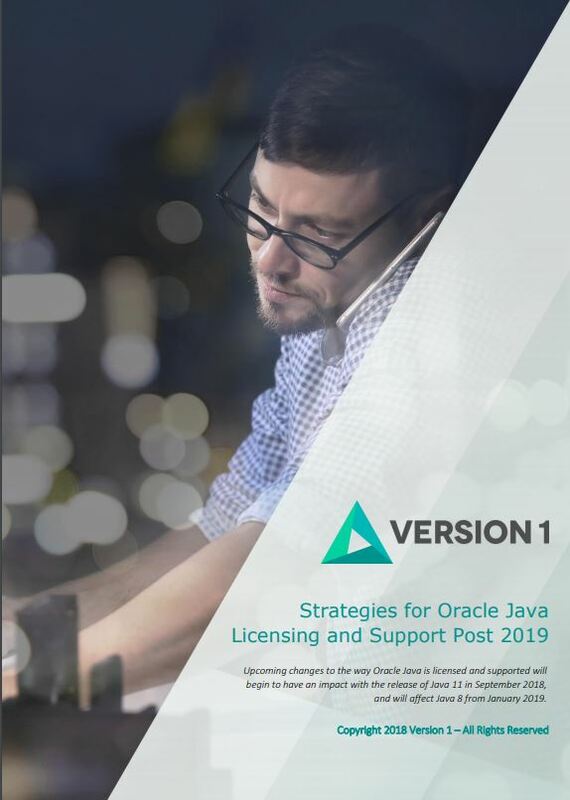 You should assess your use of Oracle Java and determine if you need on-going security patches and support – if you do, speak to a Version 1 SAM & Licensing specialist today. How will the recent changes to Oracle Java Licensing affect you?